"I use Disk Cleanup, Crap Cleaner, and EasyCleaner, and still some Web sites that I haven't visited in weeks show up in the dropdown box. I use Google and Bing, but do not have their toolbars installed. Any ideas? I've tried everything." Like most browsers, Internet Explorer records a history of the sites you've visited, the idea being to make it easier to return to those sites in the future. But what if you want to erase that history so other users of your PC can't tell where you've been? From the sound of it, Alison, you've used every tool but the right one to erase IE's history. The solution lies within the browser itself: Click Tools, Internet Options, then look for the Browsing history section in the General tab. Click the Delete button, then choose make sure the History checkbox is selected. (At this point you can also choose to remove items like temporary Internet files, cookies, etc.--but keep in mind that many of these items are there to improve your browsing experience.) Click Delete again and you're done. If you want Internet Explorer to automatically erase your browsing history after every session, check the Delete browsing history on exit box before closing the Internet Options window. 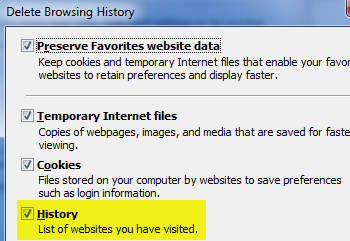 By the way, Internet Explorer 8's InPrivate Browsing feature (accessible by pressing Ctrl-Shift-P) temporarily prevents the browser from storing cookies, temp files, and your history. It's the mode to use if you want to "browse without a trace." Hope that answers your question, Allison!